re-computing the test result summary using the new configuration. Open the SLA Profile Manager. Click Apply the SLA profile to test results. 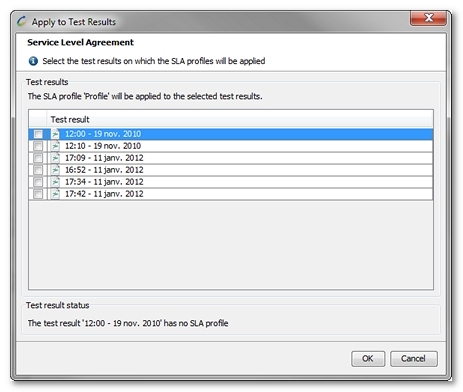 A wizard is displayed allowing you to select the test results to which the SLA profile is to be applied. Click OK. Depending on the test results selected, this operation may take some time. Information: A warning symbol on a test result means that the test already contains SLA profiles. Information: When an SLA profile is overwritten in a set of test results, the previous SLA profile is lost. This action cannot be reversed later.